Back in August of last year, Play & Leisure along with several other companies received an enquiry from Huncote Parish Council regarding the refurbishing and updating of their existing play facility on Critchlow Road, an area on which Play & Leisure had previously installed new outdoor gym equipment . After meeting with Stuart Bacon, Clerk to the Council, the brief was to update the existing toddler/junior area and provide exciting and challenging equipment for older children in a separate area of the field where the existing aerial runway and swings were. 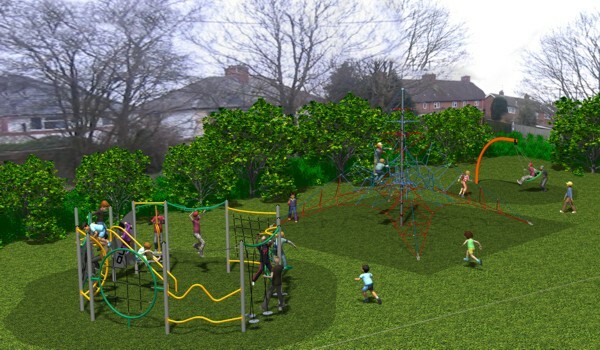 A consultation process with the local community and Councillors resulted in Play & Leisure being the preferred contractor and were given the official go ahead in December 2014. The works commenced in February 2015 by removing the existing equipment which included a Multi-unit, Roundabout and surfacing in the toddler/junior area although some of the existing equipment remained, which included the junior swings, which would be given a new coating of paint. By the end of the month all the removal work had been completed and the site was ready for the installation to start. The equipment to be installed comprised of a Quest Cosmos Activity Unit, 6m High Activity Net, Ben Lomond Multi-unit from the Mountain Activity range, Cantilever Basket Swing, Inclusive Nattertube complete with a Stongman & Abacus Play Panel and our DDA compliant Thunder Roundabout suitable for children of all ages and abilities plus a Dragonfly Inclusive Seesaw and Supernova. The site was finally completed mid-March much to the delight of the Town Council and local children who had waited a long time for the day to come. The play area has proved to be a big success and will be enjoyed for years to come!